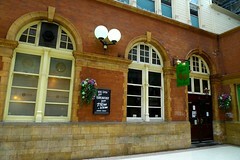 A pub opening on to the concourse of Marylebone Station. A perfectly reasonable station pub, comprised of two rooms. The room one enters first has sparse furniture (high tables with stools only), with a long bar at the back and a hard floor. The side room is larger with a range of seating options, and a plush carpeted area towards the rear (looking out over the street in front of the station) with comfortable banquettes and larger tables. There are five handpulls for ale at the bar, four of them in the main room and one in the side room. These were dispensing Greene King St Edmunds (£3.60/pint) and IPA, Fuller's London Pride, and Morland's Old Speckled Hen on Ewan's April 2012 visit. There were also two draught keg taps for Meantime London Pale Ale and London Lager, as well as a small range of the usual cooking lagers. The pub advertises "craft" bottled beer, which includes Samuel Adams, Duvel and a few others. The food menu is a basic one with all the hallmarks of a catering company photo of menu, Apr 2012. Ewan tried the mozzarella, slow roasted tomato and basil flatbread on his visit (£6) photo, which was perfectly fine, and topped by plenty of fresh rocket. Last visited by Ewan, April 2012. Last edited 2013-05-10 08:11:59 (version 2; diff). List all versions. Page last edited 2013-05-10 08:11:59 (version 2).